Entrance to world famous architect Gaudi’s Casa Batllo Masterpiece! 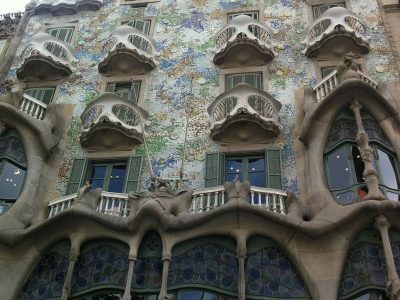 Visit Casa Batllo and live the Gaudí experience. Do you and the girls want to experience some of the incredible culture that’s up for grabs on your stag do in Barcelona? You can’t go wrong with a trip to visit Casa Batllo, one of Gaudí’s most celebrated masterpieces. Typical of Gaudí, straight lines are avoided whenever possible. From the entrance hall on the ground floor, a sturdy iron railing separates the private access to the Batlló family residence. The main suite have 3 interconnected rooms, is like a shop window display onto Passeig de Gràcia, with huge windows which let the light in. The ceiling is wavy, in allusion to the sea. 600 tiles were used to create the appearance of scales that cover the roof. In 2002, Casa Batlló was opened to the public as a museum and cultural event space. In 2005 it was recognised as an UNESCO World Heritage Site. 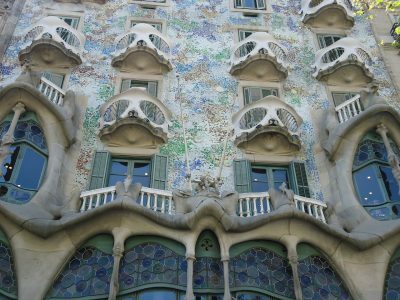 We will arrange entrance to this amazing building, so treat yourself to some culture and come and experience the Gaudí building for yourself!